E-pistle 2009/02 – Do You Believe in Bottle Maturation? But first: Why did Johannes become completely crazy? Well, that’s what some of the Malt Maniacs have been wondering about since he did put his ‘rant’ about the Scotch Whisky Association online. Mind you, it’s not his line of argument, it’s his tone of voice! We like to think of the Dutch as pacifistic people who prefer to run half-naked in tulip fields while smoking pot and drinking hard genever (or whisky, for that matter) rather than as rude and aggressive warmongers! Was Johannes simply having a bee in his bonnet? Probably, in fact ;-), but as much as we would certainly not have called the SWA crew ‘w*****s’, it’s true that what’s been heard or read about some of the association’s recent moves has been nothing but a little embarrassing. First of all, it seems that not many people have really understood the SWA’s new whisky classifications. Especially the infamous ‘blended malt’ category caused some raised eyebrows, but after all, it’s their function to make these classifications evolve, so fair enough. Our own function, as whisky lovers (vulgum pecus, really), is simply to buy the products, destroy them and say or write nice things about them (word of mouth = free publicity, huh!). Now, when we spot a genuine David vs. Goliath scheme developing, which was obviously the case with the Glen Breton vs. SWA court case, things start to go wild. The Web 2.0, this wonderful thing where everybody’s an expert, does nothing but make things go truly exponential. Yes, just like our dear Johannes’ rant. Having said that, we agree that trying to bring Glen Breton to court for the third time (or so it seems), whilst the little Canadian distillery had won the two first instances, really is a strange move, that reminds us of the Comité Interprofessionnel du Vin de Champagne (CIVC), that ruthlessly – but rightfully – keeps fighting any imitations all around the world (they even managed to prevent Yves St Laurent from calling one of their perfumes ‘Champagne’!) The only difference is that Scotch whisky is most of the time distilled from imported cereals, using a process that was invented elsewhere, is then always matured in imported wood, and now often bears added foreign wine names on its labels. Even the beautiful wooden boxes come from China, so much for terroir! So, in our opinion, it’s not too good for the Scots that they would start to be seen as too inflexible and inquisitory with distillers from other nations, when so little is actually truly Scottish in their very own products, that is to say only the places where the plants and the warehouses are! Because first, our romance and goodwill may become more and more chaotic, and second, we may really start to ask for Scottish barley only. And organic, at that! So, maybe it’s time to leave Glen Breton – and Johannes – alone? Now, the luck of the Scots is that beyond these painful issues, they keep making the best spirit in the world. Even better: a spirit that, we believe, ages perfectly well in its bottle after it has left its country of origin. We know this is controversial but let’s take this opportunity to answer a few comments that we saw somewhere else on the Web. Indeed, we’ve been pointed to the excellent Whiskymag forum where some no less excellent whisky lovers were wondering why we often insist on the concept of bottle ageing (when sealed), whilst it is common belief that whisky does not change anymore once bottled. First, we’d like to remind you that ‘it’s not because many are wrong, that they are right’ (as said the good Coluche). And second, let’s quickly list a few points that may explain why we have this belief, beyond simple observations that we could make when tasting old bottlings (hundreds and hundreds of them, actually). (1) – Wine does change once bottled, even fortified wines, so why not whisky? 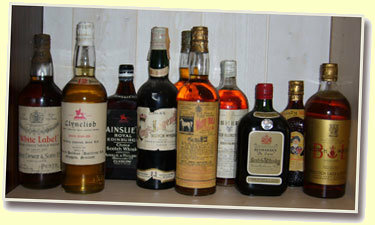 Sure whisky’s changes may be much, much slower, but whisky is also usually more poorly sealed than wine. Now, we think that bottle ageing can be noticed only after fifteen, twenty or thirty years. (2) – No cap is totally airtight, not even the spring/tin/Kork-N-Seal ones, and some closures do suffer from long storage, alcohol vapours and so on. (3) – Bottle ageing may partly explain why most old malts are NOW better than their contemporary versions. (4) – White eaux-de-vie are matured in glass, often in demijohns. If white spirits do change, why not brown/golden spirits? (6) – Some bottlers, and not the less famous of them, do insist on bottle ageing, such as the famous Silvano Samaroli who even writes about that on some of his labels. (7) – The very same Silvano Samaroli explained to us how, for instance a very young Ardbeg and a very young Glen Garioch used to be harsh and pungent when he bottled them thirty years ago, whilst they became magnificently mellow and complex after all these years in glass. He would know, wouldn’t he? (8) – Some famous distiller, whom we won’t disclose here because that may be a corporate secret (yeah, yeah) considers that whiskies, especially blends, have a “shelf life” and may acquire a “taste of glass” when sitting at some shops for too long. They even control that and try to take back these ‘odd’ bottles. (9) – Glass may well not be as inert a material as it’s believed (a long debate, let’s not start it here and now).